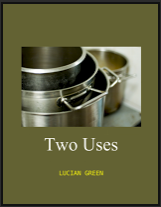 Two Uses Primary Text is about two uses for pots. Two Uses is one of the Pedagogical Ways of Thinking. • The Two Uses Prolog algorithm verifies whether a container has the two uses, can be carried and can stand. • Alexis argues for two uses while Dion reconciles his knowledge about two uses. ￼Lucian Green is a Philosopher in Melbourne, Australia. Lucian Academy is an Education provider located in Melbourne, Australia.